Making your own linen napkins is way easier (and cheaper) than you’d think! I’m about to blow your mind with how easy it is to make these no sew napkins! Every holiday, I’m the first one buying decorative cocktail napkins. The thing is, I hate throwing them away, and I really hate the way the stiff paper of printed napkins feels on my skin. I made these for a recent party and have used them a couple of times since, and I’m now a DIY napkin convert. They’re a great way to elevate your event. Everyone was asking me where I got them! I even went and got fabric to make more for Easter! As with all good rehab projects, I started with a need that turned into an idea, then I headed to the fabric shop (okay, bad projects start that way, too, just stay with me here.) I knew I was looking for a red, pink, or purple, but was willing to go with the flow based on what was available. I found this gorgeous pink color and ended up making 8 HUGE napkins for $17! The napkins looked gorgeous with the lace runner and vintage dishes at my Galentine’s Day tea party. The only tools you need for this project are the linen and fabric scissors. Believe me, fabric scissors are necessary. They make a huge difference in being able to get straight lines and smooth cuts. Wash and dry your fabric to preshrink it. If you want to skip the prewash, I’m sure you’d be okay just cutting the napkins larger than you normally would to allow for some shrinkage. Decide how many napkins you want/ can get from your piece of cloth. I did this by folding my fabric and estimating how big I’d want each napkin to be. I do everything based on look, so I’m sure if you wanted to measure, you could get really specific and make lines on your fabric with a fabric pen, but why make it harder than it needs to be? Cut your fabric! I used the folds to guide how I cut the fabric. It’s easier for me to cut when I’m holding both sides of the fabric and can get the scissors flying smoothly! Before you get to make a mess! Then you’re ready for the fun! Pulling out the fabric at the edges to create the pretty frayed look. It can be messy, but that’s half the fun, right? I pulled the fabric around the edges while I watched an episode of Fixer Upper. Pulling out the edges. You want to work from the piece on the outermost edge first. Otherwise, the strings can get tangled. Enjoy your new napkins! Yep, that is it! Wash, cut, pull, done! I love decorating my house for every holiday. Even more so because here in LA we generally have two seasons- warm and sunny and hot and sunny. Easter is one of my favorites (okay, every holiday is my favorite!) because I love using all the springtime colors. You know what DOESN’T go with springtime colors? Red! I have these red pillows on my couch that are ultra comfy, but pretty much only work at Christmas. 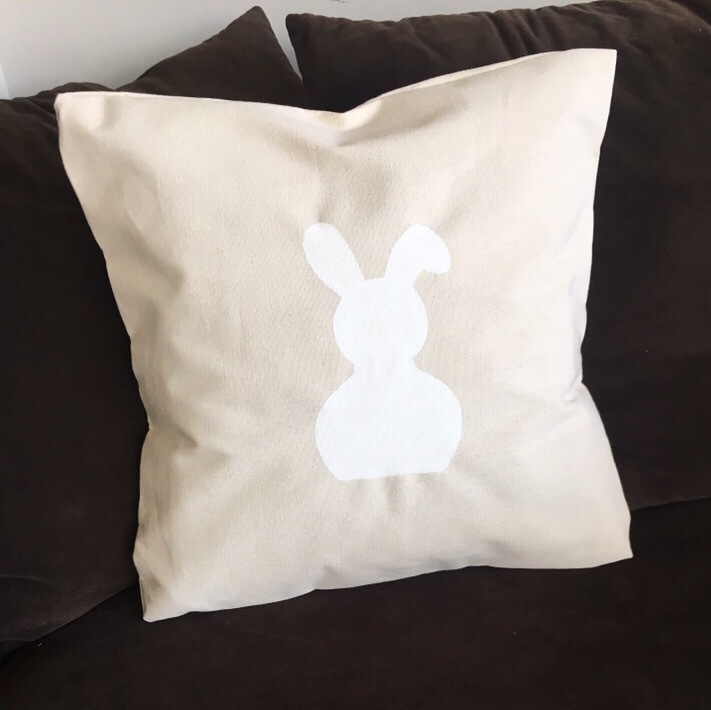 Instead of changing out my pillows or buying expensive covers at a store, I decided to go with a cheaper solution and make some Easter-y, springy pillow covers. My first thought was to use burlap, but I wasn’t feeling any of the weaves I saw at the craft store. Canvas was on sale, so I got some for $6 and headed home. 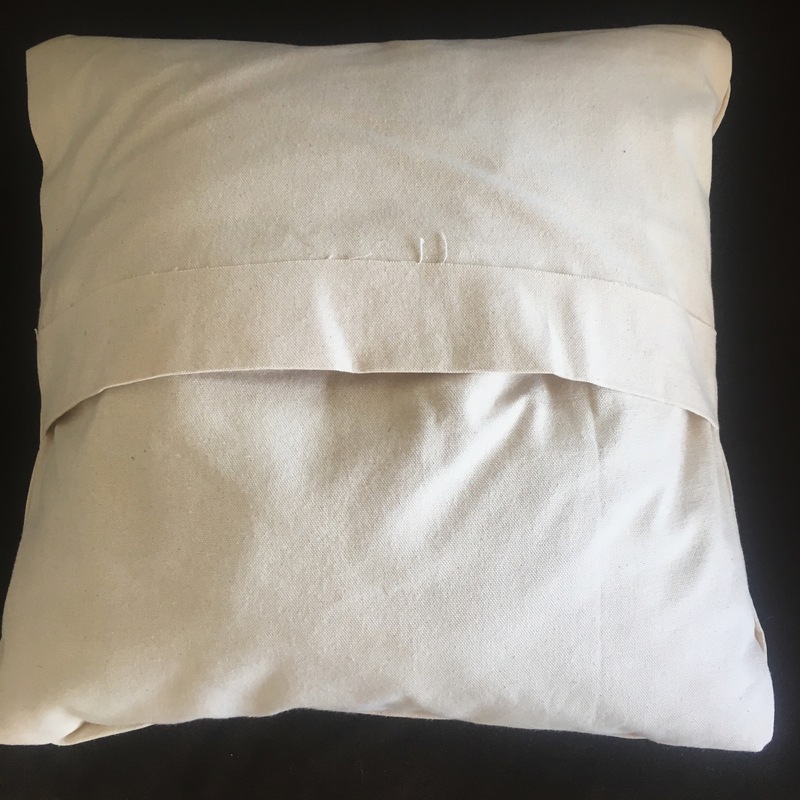 YES, I MADE OVER MY PILLOWS FOR $6! I had all of the materials at home, so you may spend a little more, but if you’re an avid rehabber, you’re really only paying for the fabric itself. Your first step would usually be to wash your fabric, but since I’m only going to be using these pillows for about a month and I’m super lazy, I skipped this step. I just ironed the major creases out of the fabric so that I would be able to get a good, straight cut. I put my pillow on top of the fabric to measure what I’d need and cut out my three pieces. 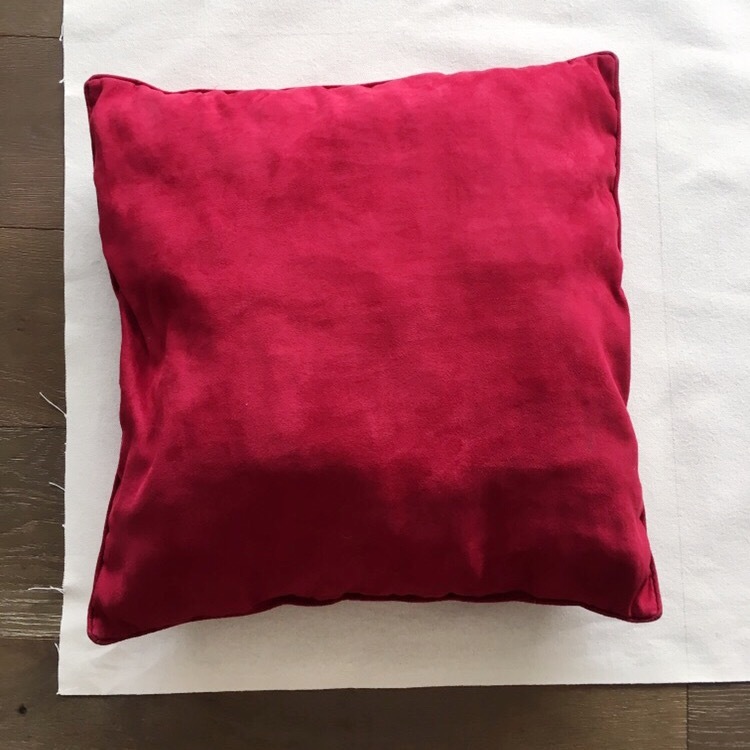 To put the pillows together, I used this tutorial from Amy at Homey Oh My since I’ve only ever made pillows using my machine or by hand. After cutting out fabric pieces came the fun part- painting! 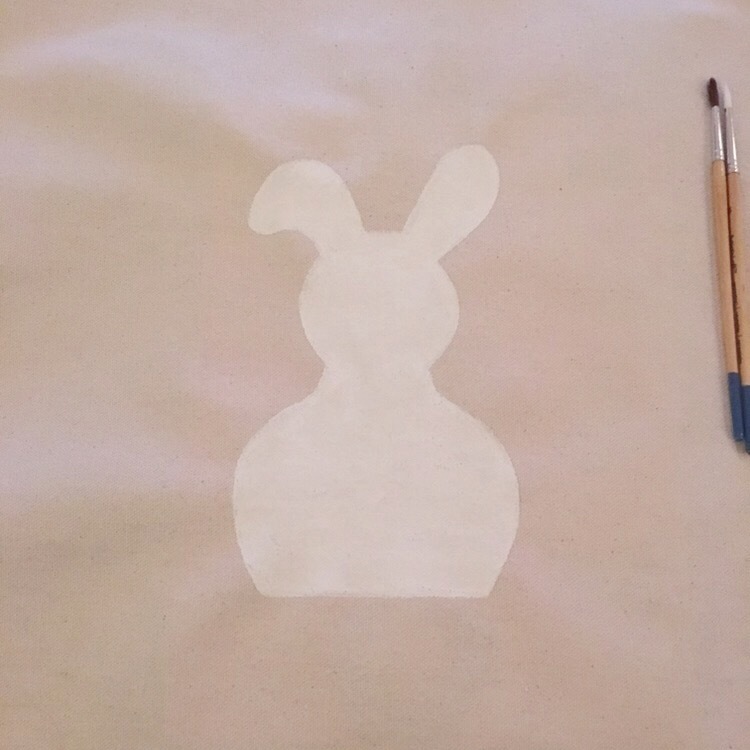 Using pencil (couldn’t find my fabric pen or chalk), I lightly traced a bunny form that I had on hand. If you’re good at drawing, you could totally sketch something out. Then I painted over and filled in my outline with white fabric paint. Easy! My bunny right after painting, right before drying overnight. I let my bunny dry overnight then got to gluing. This is where you really want to pay attention to Amy’s tutorial! Yes, I did use a trash bag to protect the floor from glue, just in case! I used the triangle to make sure I applied the glue straight on the edges. 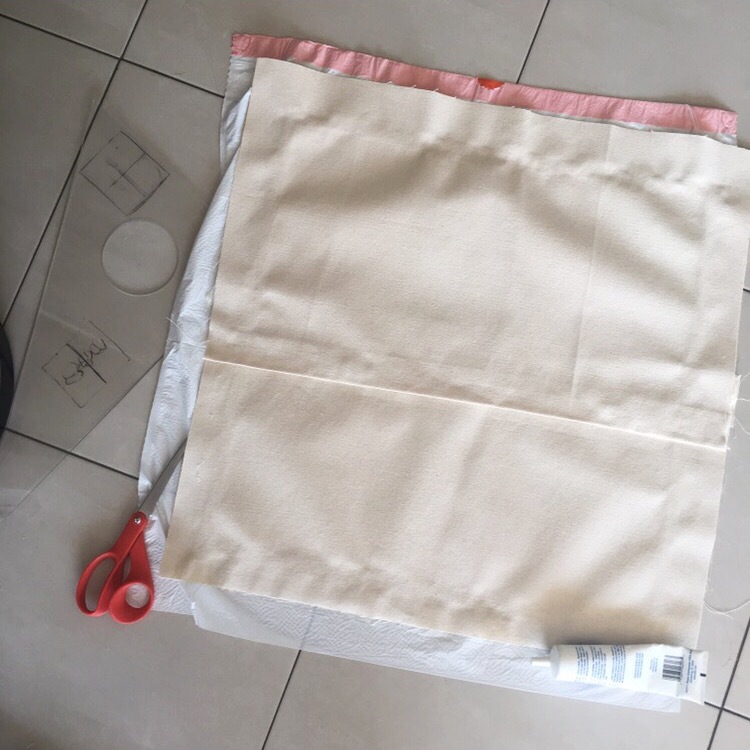 Here’s where I made a mistake– when you’re sewing and pinning fabric, it is easy to see if you put a piece on backwards. When you’re gluing, make sure you check before you apply the glue! I put the back pieces on backwards, which ended up being okay because I like a rustic look. But if I was sewing, it would have been easy to just rip out the seam. Here’s where I messed up! Make sure to check how everything lines up before you glue! I let the cover dry for the day, then flipped it inside out and stuffed the red pillow inside. Voila! A whole new look!